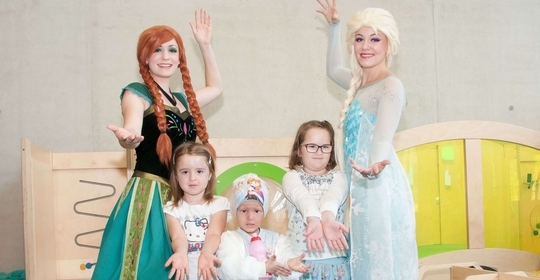 The West German Proton Therapy Centre in Essen (WPE) received a very special visit: two ice princesses. They came to visit the young patients, paint their faces, put on nail polish and dress them up to look like radiant ice princesses. Afterwards, they all danced, played, performed a little magic and sang together with their siblings and provided a fabulous atmosphere in the foyer. This activity, organized by WPE’s Social Psychologist, Nicole Stember, who has been providing psychosocial care to children and their families since the beginning of the year, will not be the last. On a regular basis, similar action days are planned alternately for children and adolescents treated at the WPE. The association “Strahlemännchen.de – Herzenswünsche für krebskranke Kinder e.V.” has supported this premiere.